Published on NowUC on the 20th of October, 2010. The 14th of October was an international day of action against Japan’s annual dolphin hunt. Protests were held in Canberra and other cities around the world. Where does the dolphin hunt take place? 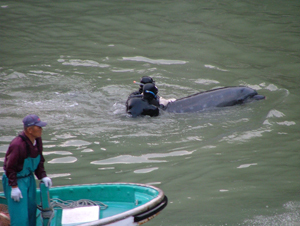 The dolphin hunt happens every year in the small fishing village of Taiji, in Japan. It takes place from the 1st of September through to March. The annual hunt gained international attention last year when it was the subject of the 2009 Academy Award winning documentary The Cove. Since the film was released, thousands of letters and emails have been sent to the Japanese government, but the hunt continues. It is the largest scale slaughter of cetaceans in the world. Is the dolphin hunt legal? Yes, the Japan Fisheries Agency issued 23,000 permits to kill dolphins and other small whales this season. The Earth Island Institute of Berkeley, California, believes that the hunt remains legal as it is kept quiet, the majority of people in Japan are unaware of the dolphin hunt. How are the dolphins killed? The president of Animal Liberation ACT, Jo Morgan, has recently returned from Japan. She saw first hand what is happening in Taiji. Ms Morgan said the fishermen herd the dolphins into a hidden cove by affecting their sense of direction. When dolphins are spotted, long metal pipes are put into the water, fishermen bang on the pipes creating a wall of sound. The sound disorients the dolphins, they swim away from the sound and are herded into the bay. Nets are drawn across the bay to keep them penned in. Are the dolphins hunted for their meat? How is the dolphin slaughter any different from the slaughter of cows and pigs in Australia and other Western countries? The fishermen claim that there is no difference. The Japan Fisheries Agency argues that bottlenose dolphins and the other dolphin species that are killed are not endangered. The government of Taiji released a statement that said the dolphin hunt is part of their tradition. Fishermen say an attack on this industry is an attack on their culture. Many dolphin activists would like to see an end to the methods used in Western slaughterhouses as well, but they argue that the way in which dolphins are killed is particularly brutal. The Earth Island Institute believes that the Japanese people have a right to know what they are eating and what is being fed to their children at school. Does the hunt look set to continue? The mayor of Taiji has stated that as long as he is in office, the dolphin hunt will continue. A small group from Sea Shepherd have been in Taiji since the season commenced in an attempt to raise public awareness and to film the activities of the fishermen. Since the Japanese release of The Cove in July this year, the Sea Shepherd crew have noticed an increase in support of their campaign (pictured) from the Japanese people.